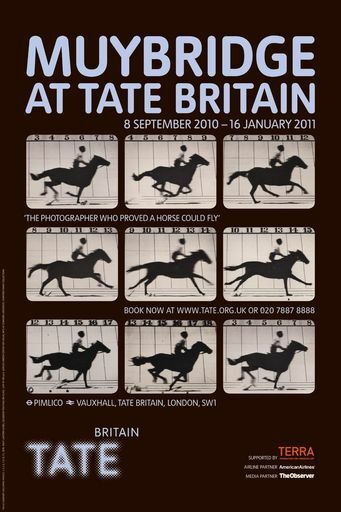 I spent an enjoyable day down in London on January 15th visiting the Tate Britain, and in particular the Muybridge exhibition which was due to finish the following day. The main reason for visiting was due to my ongoing interest in animal gaits (insects and other hexapods in particular), and the Muybridge animal locomotion photographs have been an inspiration for many years as well as providing material for lectures and summer schools. 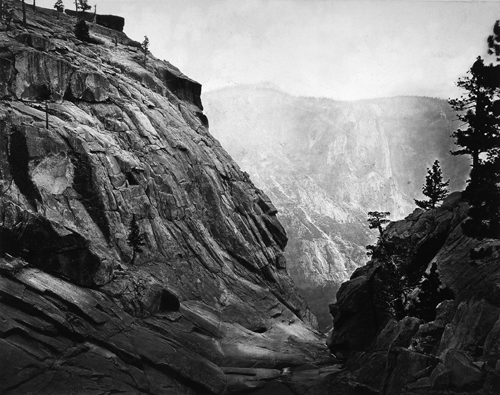 The most striking impression of the exhibition, before you even reached the sequential photography for which he is most well known, is the outstanding landscape photographs from which he originally rose to prominence (many using a technique he developed to block out the sky to circumvent the problem of overexposing some parts of the plate). Alongside these were his famed lighthouse photographs (he was commissioned by the US Light House Board to catalogue all their buildings), 360 degree panoramic views of San Francisco from the balcony of his benefactor Leland Standford, and many of his stereographic pictures which really showed just how far ahead of his time he was (as well as how astute he was i marketing his photographs). His innovative techniques, at a time remember when photography was in its infancy and moving pictures were undreamt of, really did position himself at the forefront of his profession. There was also a summary of his personal life which I had not been aware of before, being absent during the Civil War after returning to Britain to recover from illness, marrying a 19 year old divorcee, and subsequently murdering his wife’s lover after finding an incriminating photograph in her drawer, how ironic (it was actually some writing on the back implying that their son was not his rather than a raunchy picture). Muybridge of course was exonerated in the ensuing court case, not least because he was up against an all male jury, but his reputation never recovered. The main draw for me however was his photographs of animal locomotion, which I have been familiar with for 20 odd years but to be able to see, up close, tha actual glass plates from which they were produced was a thrill. The story goes that the motivation stemmed from a bet that Stanford had with a colleague over whether or not a horse always had at least one foot on the ground when galloping. The photographs, using a set-up of trip wires and multiple cameras took years to perfect, but eventually confirmed without doubt that there were phases when all four feet were off the ground. Due to a great many men who made their fortune on the railroads owning horses, and wanting Muybridge to photograph their thoroughbreds, many of his studies were on horses. Later University funding would allow him to expand to elephants, bison, lions and a great many studies of human movement (including the famous woman walking naked down stairs which, was an inspiration for paintings by Marcel Duchamp). 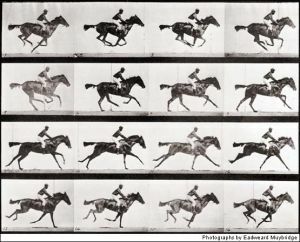 Many of these stills Muybridge used to produce discs for his “zoopraxiscope” which then projected the images one after another onto a screen to produce what, in those days, were some of the first moving pictures and the forerunner of modern cinema. This device rotated the disc in one direction, and another disc with slats in it in the other resulting in an apparently continuous motion (recreated below by a moving gif, each frame of which is a frame of the horses to the left). There is an exhibition guide still up at the Tate Britain website, and permanent exhibition of his work in Kingston (where he was born, and eventually died). Additional link (20th May 2015): there is an excellent Muybridge section at Artsy.net.